Lee Lifting Services operate a range of cranes from 10 to 220 tons.All machines are regularly maintained and serviced to ensure reliability. Independent inspection and testing is also carried out on machines and lifting tackle in line with current legislation.We carry an above average quantity of lifting tackle on all machines so no additional charges are incurred for most lifts. 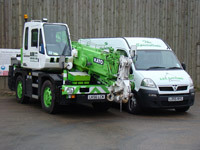 Our range of machines include a very compact 10t city crane ideal for lighter items into confined spaces to a 40t crane which whilst still having a compact design is capable of far greater weight and radius, at the larger end of our fleet is a 220t all terrain machine which can be rigged with removable inserts to achieve an overall jib length of some 93 metres. All Terrain – a specifically designed vehicle with greater ground clearance, all wheel drive and all wheel steer make this a more versatile machine in terms of access and useabilty. City – All the advantages of an all terrain machine but in a more compact unit. Specifically designed where working space is a premium ie. In built up areas. 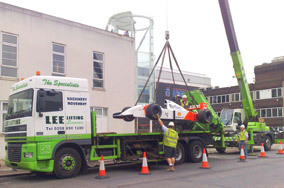 Lorry Loader – Commonly known as a ‘hiab’. 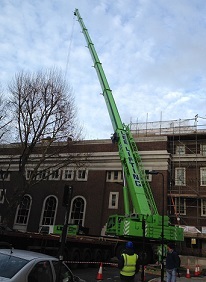 A crane arm mounted on a lorry also equipped with a load carrying bed. 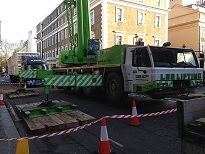 Initially the arm was just large enough to offload the vehicle but through constant development are now large enough to carry out lifts traditionally done with a mobile crane. Our current fleet of vehicles we believe enable us to provide a very versatile approach to the ever increasing requirement for safer lifting of equipment,materials and personnel. We also have a range of fully inspected and certified lifting accessories such as personnel and material carrying baskets,spreader beams, brickforks, cargo nets etc which are available at reasonable rates. Our workshop is fully equipped to fabricate accessories for specific lifting applications which are then independently tested and certified.This facility enables us to produce one off items quickly and efficiently to ensure a smooth hassle free operation at the time of the lift.